I hope everyone had/is having a good Christmas Break. If you’re in the latter category, I fart in your general direction. Actually… I can’t complain. Despite my Australia trip earlier this year, I had a lot of vacation time leftover at work, so I took the entire week of Christmas off. I’m just bitter today; having to go back to work after a long break does that to me. It was a fun break from work, although they always seem too short in retrospect. I didn’t get as much writing done as I had hoped, but that’s mainly because I took a road trip instead. I knew I would have to be back in town for Christmas, but I still had a few days of my own to play with, so I loaded plenty of music onto my new Droid and hit the road. This wasn’t just a spontaneous, random trip: the idea had actually been bouncing around in my head for a few weeks. And I didn’t drive just anywhere; I had a specific destination in mind, namely, the Outer Banks. 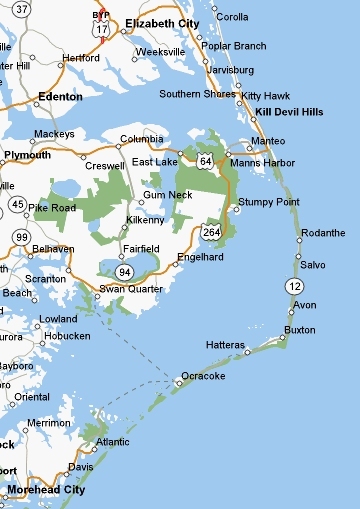 For those of you not familiar with North Carolina geography, the Outer Banks are a series of barrier islands that run along the coast. You can access them either via ferry or road bridge (although certain sections, like Ocracoke Island, are only accessible via ferry). I knew it would be cold, windy, and out of season– the Outer Banks are very much a tourist economy, and the more remote sections pretty much shut down during the winter. But the probable lack of tourists appealed to me, and besides, I had an additional motive for going. The ocean plays a fairly large role in a few key scenes in my novel, and I wanted to refresh my memory of what it was like. Despite living in a coastal state, I haven’t actually made it out to the ocean since a trip to Florida in 2006. I wanted to get re-acquainted with the smell of it, the sound of the waves, the taste of salt in the air, the feel of the sand between my toes… maybe not the feel of the water, though. That would be pretty cold. I also needed to write a couple poems to use as song lyrics; in one of the scenes, a character from an oceangoing culture sings some songs around a campfire, and in my mind, it’s a great moment that connects the emotions of people from two very disparate cultures. But I haven’t actually written any poetry in years, and it doesn’t flow easily for me. Nevertheless, I hoped that by actually being at the ocean, I could get the ol’ brain cells firing. It sort of worked. I jotted down occasional bits of imagery or description that came to me; I didn’t get any full poems written, but at least I have some starting points. I also realized that part of the prologue, which I’m currently editing, rests on an invalid assumption. See, I had this image in my mind of the waves crashing one at a time. Wave crash. Silence. Wave crash. Silence. That repeating sequence of noise and silence was a key part of the scene, but when I stood on the beach, listening to the waves, I remembered that, in reality… the noise is pretty constant. Sure, you can pick out the sound of individual waves if you’re right by the water, but even then it’s really just a constant roar of water, punctuated at irregular intervals by crashing waves. It’s amazing the sort of things that can slip your mind during the carefree crazy days of NaNoWriMo. Other than that, I mainly just spent a couple days exploring. I spent the night in an oceanfront hotel that was so quiet I startled the desk clerk, who must have jumped a foot out of her chair when I walked in. After that, it took her a few minutes to figure out which buildings had heat and which didn’t, and she spent several minutes explaining how all the restaurants were closed, except for one greasy pizza and seafood joint. On the bright side, I did find a nice little diner for breakfast that did awesome pancakes. Now that I’m back, and Christmas is over, it’s time to get writing again. More on that in my next post. I got me a new toy this weekend: my first-ever smartphone, a Motorola Droid. It’s been a while since I’ve bought a new gadget to geek out on… in fact, I usually avoid buying new technology. My laptop is over two years old, my most advanced gaming console is a PS2, and my TV is a 27-inch CRT from Wal-Mart. For someone who makes his living developing software, I’m actually quite the luddite. This year, I decided the Droid would be my Christmas present to myself. My contract with Verizon was up, it was time to upgrade, and I didn’t particularly feel like switching networks. Alltel (now Verizon’s) reception is great in my area, and while the iPhone intrigued me, that would require switching to AT&T. I’d rather chew glass, thanks. So I got my new toy and have been geeking out over it ever since, trying different apps, playing with ringtones, widgets, and generally customizing the heck out of it. Of course, being a writer, I immediately wondered if it would be feasible to use it for writing. The pull-out keyboard seems to be decent, but I don’t see myself doing much writing with it. It’s no substitute for a laptop… or even a paper notebook. I can write with a pencil faster than I can type on the phone, and even though that would likely change with practice, I don’t see using the Droid as a substitute for the spiral notebook which I carry pretty much everywhere. I like being able to sketch maps, freewrite, doodle, make lists of seemingly random ideas, and for now, pencil and paper remains a friendlier interface for me. As for actual writing, I’ll probably stick with my much-more-comfortable laptop, although I could see myself writing with the Droid if I ever had a sudden brainstorm and it was all I had with me. I haven’t seen any other apps in the Android Market that have made me go, “Wow, that would be useful for a writer!”, but if anyone has any suggestions, let me know. My final word count for National Novel Writing Month ended up at 59,117 words: a hair short of my personal goal of 60,000, but well over the official goal. I suffered from a precipitous drop in motivation near the end; I don’t think it’s because I passed the 50,000-word mark so much as I was losing track of where the characters were going. I mentioned in the last post that I was probably going to go back and do some editing on what I’ve written; now I feel like that’s a necessity. During NaNoWriMo, I was sort of (sort of? how about totally) making things up as I went, and so the characterizations and setting details in particular tended to vary from scene to scene as I tried out different things. Now I want to go back and eliminate some of that, or else I don’t think I’ll be able to write the rest of the first draft, even if it is just a first draft. I think that’s because of how I learned to write. Most of my longer stories up to this point have been fanfiction, where I would post a chapter at a time to the web, then get to work on the next chapter. So even to this day I have this overwhelming urge to make sure each chapter is in at least a readable state before I go on to the next one. Sort of like building a tower: you want to make sure that each level is secure before you move on, or the whole thing is going to collapse in a rickety mess. I know for others, a first draft is just sort of like throwing a bunch of stuff at the wall and seeing what sticks, but I don’t seem to work that way. A messed-up sleep schedule hasn’t helped, either. My body still apparently remembers many productive writing sessions between 1 and 3 in the morning, because that’s still when my energy naturally peaks. Oh well. For now I’m chalking up these last several days to “recharging the creative batteries.” I read the prologue of my NaNoWriMo novel to my writing group this evening, and got some good feedback, so hopefully that’ll spur me on to doing some editing.